Pharaoh finally sends B'nei Yisrael out of Egypt. With pillars of cloud and fire, G-d leads them toward Eretz Yisrael on a circuitous route, avoiding the Pelishtim (Philistines). Pharaoh regrets the loss of so many slaves and chases the Jews with his army. The Jews are very afraid as the Egyptians draw close, but G-d protects them. Moshe raises his staff and G-d splits the sea, enabling the Jews to cross safely. Pharaoh, his heart hardened by G-d, commands his army to pursue, whereupon the waters crash down upon the Egyptian army. Moshe and Miriam lead the men and women, respectively, in a song of thanks. After three days travel only to find bitter waters at Marah, the people complain. Moshe miraculously produces potable water. In Marah they receive certain mitzvot. The people complain that they ate better food in Egypt. G-d sends quail for meat and provides manna, a miraculous bread that falls from the sky every day except Shabbat. On Friday a double portion descends to supply the Shabbat needs. No one is able to obtain more than his daily portion, but manna collected on Friday suffices for two days so the Jews can rest on Shabbat. Some manna is set aside as a memorial for future generations. When the Jews again complain about a lack of water, Moshe miraculously produces water from a rock. Then Amalek attacks. Joshua leads the Jews in battle while Moshe prays for their welfare. Its very difficult to change things we dont like about ourselves. We are all creatures of habit. One of the hardest aspects of modifying negative behavior is breaking the patterns that we weave for ourselves. How long do our "New Years resolutions" last? A day? A week? Not through lack of resolution, but because resolution is no match for habit. Resolution is not the solution. To succeed, we must do something much more fundamental. When G-d took the Bnei Yisrael out of Egypt, He did not take them the quickest and easiest and most direct route from Egypt to Eretz Yisrael: northeast along the coast of the Mediterranean through what is today Gaza. Rather, He took them a long, difficult, and tortuous path across a sea and through a major desert. Why? As the saying goes, easy come, easy go. When the Jewish People left Egypt they had not entirely freed themselves from the clutches of the negative drive, the yetzer hara. If G-d had brought them the easy way, they would have been in danger of being lured back to the constricting but comfortable life of slavery in the fleshpots of Egypt. G-d, as it were, burned their bridges. He made it virtually impossible to return to Egypt. Which was just as well. For, as we see, when the going got tough in the wilderness, the Jewish People were more than willing to return to Egypt. Had that been an easy option, the history of the Jewish people might have been very different. Ostensibly, then, when faced with trying to escape the clutches of our negative drive, we must burn our bridges. If we want to separate from bad company, we must be prepared to leave and move to a different neighborhood. If we have a serious weight problem, we must put a lock on the fridge and entrust the key to our spouse (unless hes/shes trying to lose weight as well). However, in Parshat Vaera (8:23), the Torah itself presents a contradiction to this logic. When Moshe tells Pharaoh that the Jewish People are leaving, he talks of "only a three-day journey." Moshe knew full well that once they were out, they werent coming back, so why did he tell Pharaoh it was for only three days? 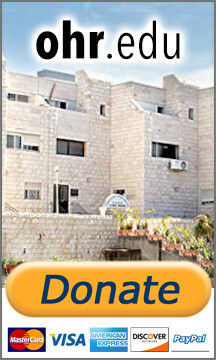 Part of Moshe intention was to appease the latent negative drive still lingering in the hearts of the Jewish People. Leaving for three days is a far less daunting prospect than leaving forever. The Jewish People thus felt they had a get-out clause, if they needed it, and were prepared to go along with Moshe. For three days at least. The Exodus was effected then both though a bribe to the negative drive, the lure of a three-day round-trip ticket on the one hand, and on the other, an iron-fisted scorched earth policy of no return. When we wish to leave our own personal Egypts, our personal prisons that the negative drive constructs for us, which is the correct course to follow? The answer is we need both. For someone who smokes 40 cigarettes a day, the idea of going cold turkey is pretty horrendous. But tell him that if after two weeks and hes not happy he can go back to smoking like a chimney, youll see a different picture. Seduction and bribery are our opening guns against the negative drive. Afterwards we have to follow up by burning our bridges. It was the lure of a round-tripticket thatgot the Jewish People as far as the edge of the water, but it was only Nachson ben Amiadav who jumped headlong into the sea and showed that there was no turning back that made the waters divide.